All Service Cases, Human Resources and KPIs from a single unified dashboard. Manage relationship and interactions with suppliers, customers and employees – from any device. 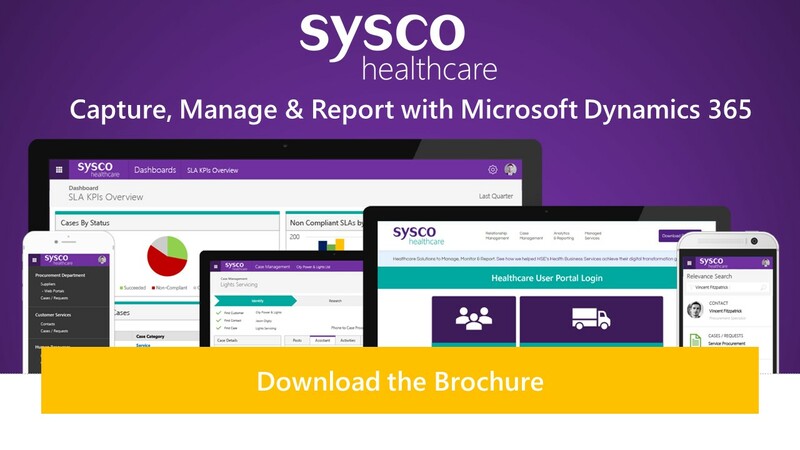 Sysco’s Healthcare platform is a digital transformation solution that unifies and provides a single view of various departments within a healthcare organisation. These departments are providing the ”behind the scenes”, infrastructural backbone that allows for the delivery of front-line health and social care services to those who need it. Sysco Healthcare can provide a single view of Procurement, Customer Service and Human Resources. That will allow a healthcare organisation or business unit to Capture, Manage and Report on the key performance indicators they need to make sometimes difficult strategic decisions – removing the need for guess work and keeping everyone on track. Identify, allocate and track KPI’s for business units and individuals. KPI’s can be viewed in drillable graphs and charts. If there is information shown on a graph or chart that you want to investigate you can simply click into the section of the graph or chart you are interested in. View live cases at a glance to see the overall state of business. Drill down into case ownership by individual – proactively attend to issues before they arise. Create custom dashboards that only show the most relevant items such as Non-Compliant Cases which need to be resolved or actionable items per user.